In Divinity Original Sins, the source hunters disembark from their ship and head for the beach. They have been asked by the wizard Arhu to come to the city of Cyseal. Apparently, the councilor Jake has been murdered. The source hunters are asked to investigate this murder. 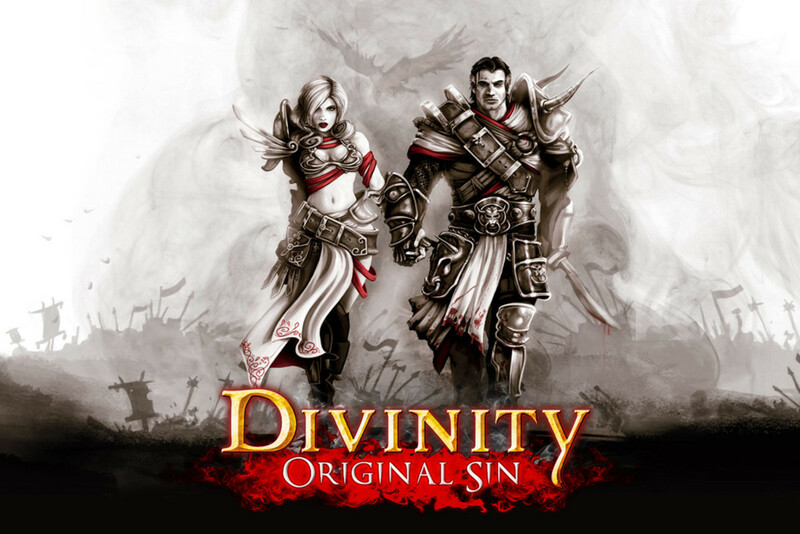 This divinity original sins walkthrough will guide the heroes with the first few fights and quests of the game, and how to get to the city of Cyseal. 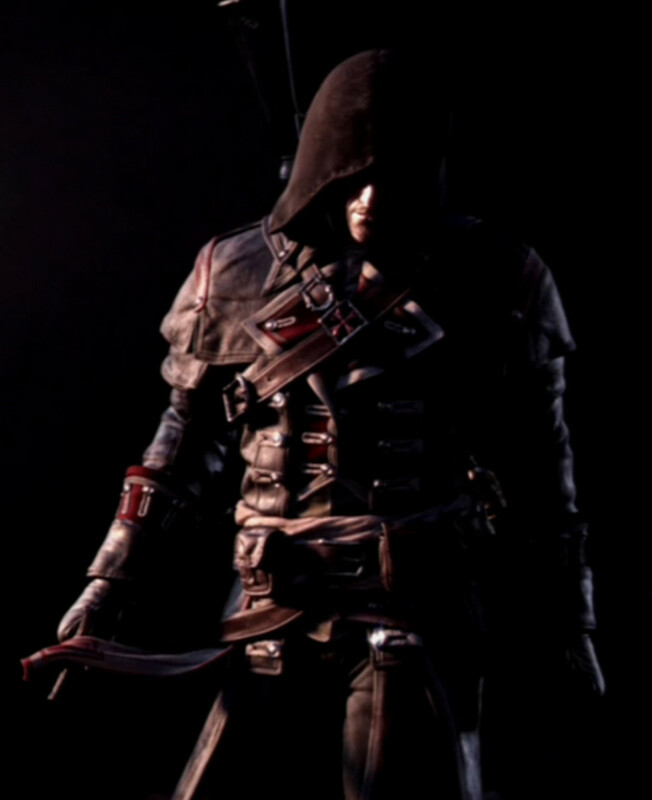 It will primarily focus on the quest A Mysterious Murder. The heroes will march west from the start point towards the bridge that leads to the city of Cyreal. The first fight will involve a fight with some crab underlings and a giant crab. 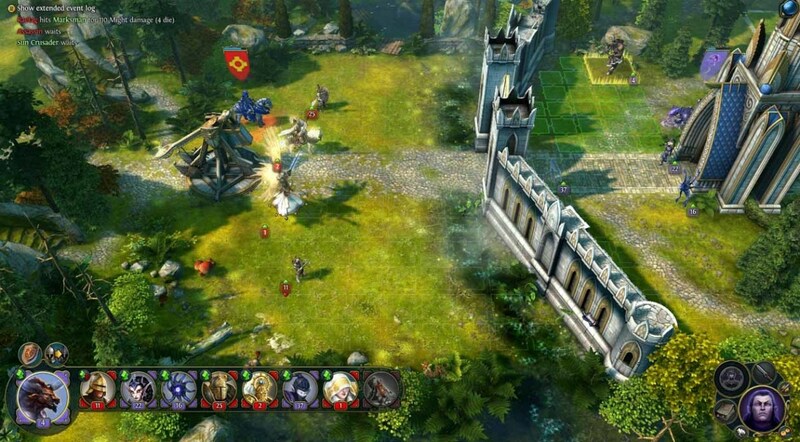 The heroes will use this easy battle to test the fight mechanics in Divinity Original Sins. The mage hero will unleash firebolts onto the crab underlings. Then she may want to use teleport on the giant crab. Use healing on your characters when health is low. Use the ranger to attack from far. If the second hero is a rogue, one can try out the backstab skill. At this point, due to the lousy weapon the rogue has, backstab does not have its legendary damage yet. Defeat the crabs and move on to larger and deadlier foes. Divinity Original Sin Orc Fight at the Beach. Along the way, the heroes will meet two legionnaires who suspect the heroes of being spies. Talk to them and then move along the beach towards the first fight with the orcs. Orcs, led by a human cultist, have landed on the beach. The party at this stage consists of a wizard and a rogue. 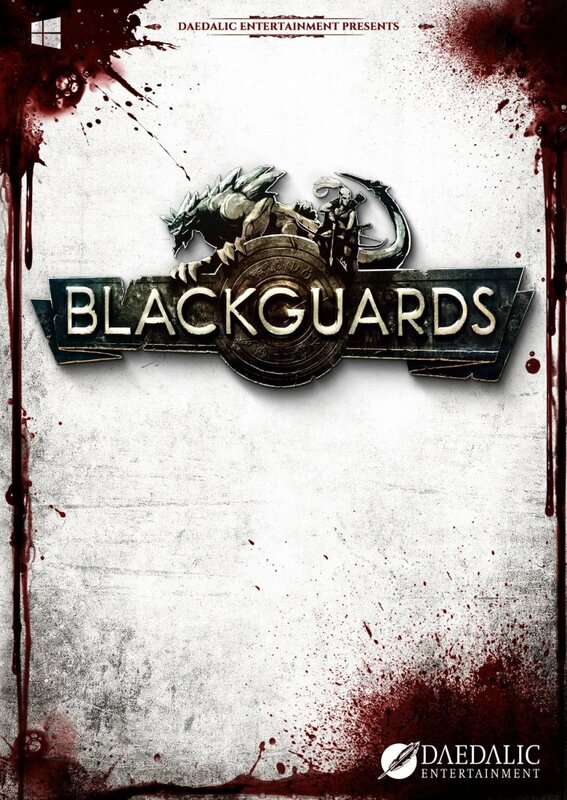 Join the guards at the beach and defeat the orcs. Next, head to the gates of the city of Cyseal and meet with the wizard Arhu. Before doing this, collect the mage scroll rain around the battle scene. After the hero meets with Arhu, proceed into the harbour, where there will be a ship burning due to the incendiary attack by the orcs. Use the mage scroll Rain to create a shower above the ship. The fire will be put out and the ship will be saved. The wizard Arhu has asked the source hunters to solve the mysterious murder quest. These are the steps to solve the quest. Divinity Original Sins where to get the shovel for to dig out Jake's body in A Mysterious Murder quest. Use the wayshrine teleporters to get there and back to the city of Cyseal. Go to the barracks and meet with the garrison commander Aureus. Talk to him and get his permission to go to the tavern or inn to investigate the scene of the murder of councillor Jake. Go to the tavern and pick up your first NPC companion Madora. She is a fighter - fire mage specialist. She will be the vanguard in a fight and is very important. 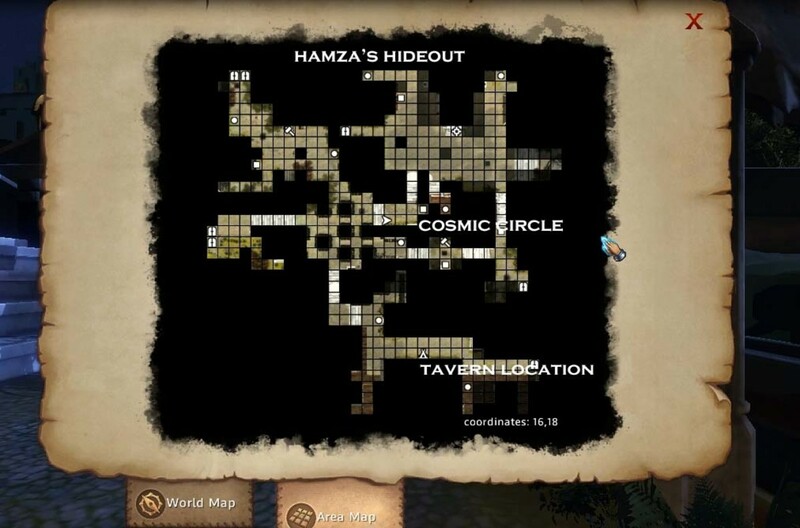 Also pick up the Fabulous Five quest before entering the tavern. Inside the inn, go straight to the room where the murder was committed and speak to the guard outside. Enter the room. Being source hunters, entering the room will trigger off the source magic. Step outside the circle of fire and outside the room. Search for a love letter in the room (see below). Go to the mortician's shop next to the cemetery and speak to Roberts the local mortician about the Jake's body. Next go to the cemetery and dig out Jake's body. 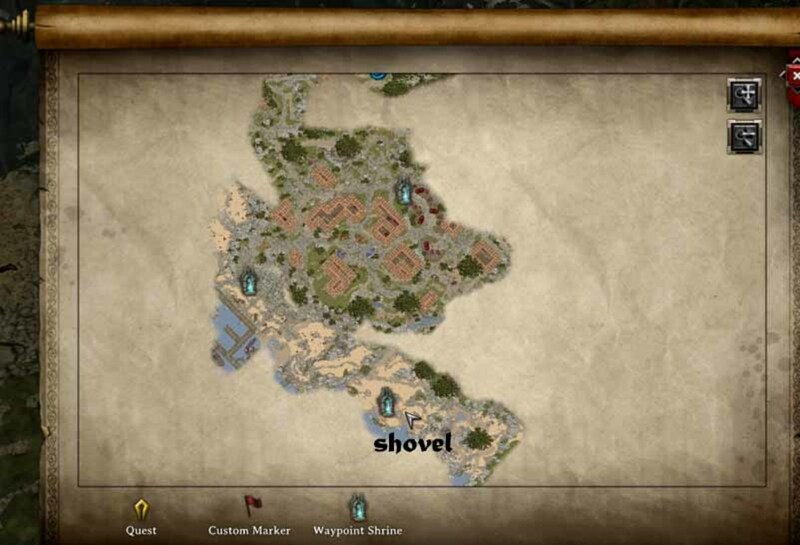 The shovel needed is shown in the map. Go to the mortician's shop again and speak to Roberts the local mortician about the missing body. Then go downstairs and pick up Robert's book. Go back upstairs and speak to Roberts again. There are now 4 suspects in the mysterious murder quest. These 4 suspects could have taken Jake's body - Mayor Cecil, Captain Aureus, the healer's apprentice Evelyn and Jake's wife Esmeralda. Go speak to the healer's apprentice and her master Thelyron first. Then go speak to Esmeralda (see below). When the heroes go back to the healing mansion, Evelyn is gone. Speak to her master Thelyron and know that she has left her pouch in the healing lodge. Go pick up her pouch and the key to her house. Go to her house and enter. Next, search her house thoroughly especially the book shelf in between the two doors. Pick up her book and learn the location of Evelyn's secret lab. Go to Jake's wife (Esmeralda) shop and speak to her. Go to the area in her shop before the counter and use the rogue to go into sneak mode. Unlock the door to Esmeralda's private chambers and enter within. Look for the following item - the book of perfect murder in her private quarters (on the desk). Next, descend into the basement and look for the bloody knife. To open the secret chamber in the basement, remove the pork from the hook and press the button. Speak to Esmeralda and she will direct the heroes to speak to the healer nurse Evelyn (see below). The heroes can pick up the fabulous five quest from the man called Mendius outside the inn. The Fabulous Five is a guild that Mendius belongs to. Go speak to Mayor Cecil who says that there is a rogue robot in a cave north of Cyseal. The heroes must defeat the rogue robot and clear the cave. Before going to the cave, the heroes need to have a party of at least 4, including the NPC Madora and Jahan. 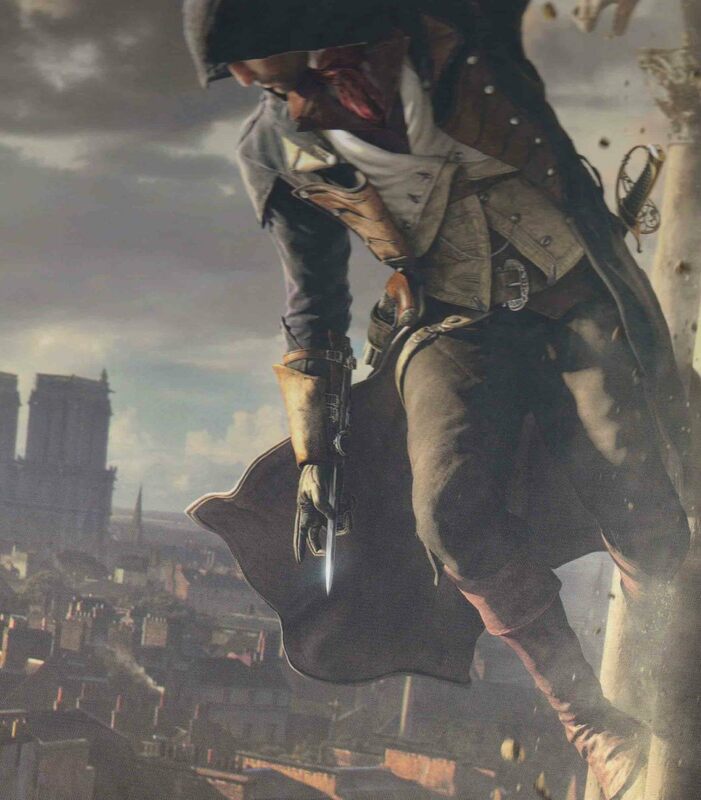 Jahan (NPC) is found in the library above the mayor's office. He is a water mage specialist. From the barracks, head north until the heroes reach the cave. There will be a massive fight between the heroes and the undeads. The heroes need Madora to go into the midst of the undead whilst sneaked and unleash her phoenix powers. Go inside the cave and go right. The robot lies ahead. Again move Madora into the frontline and unleash her powers. Use your mage hero to attack the robot with firebolts and heal Madora with healing. Use the water mage Jahan to freeze the robot if possible. Finally use the rogue or ranger to attack from far. One of the heroes may die, but the robot will be defeated. 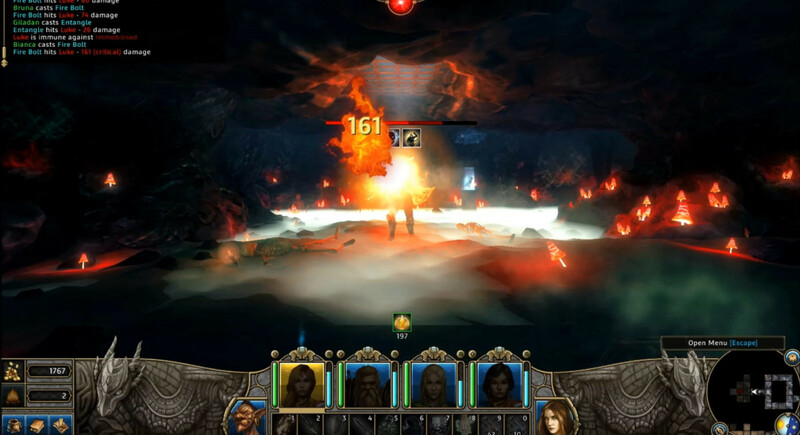 The heroes now need to proceed to Evelyn's house and Evelyn's hideout. This will show the way. Still one my favourite games in the genre, this walkthrough is tempting me to play it again. Where is the walkthrough for the other acts? thanks for your comments, keep them coming, please follow and share - facebook, tweet, pintarest, cheers! I was referring to the walkthrough "A Mysterious Murder". You describe the bloody dagger thing in the following walkthrough (the Councillor's Wife) but the dagger should be found first. So either to place "A Mysterious Murder" after "the Councillor's Wife" or you move the dagger search from "the Councillor's Wife" to "A Mysterious Murder". It seems you've missed a detail in your walkthrough : The bloody dagger in the cellar has to be collected or else when you return to the clinic the healer's assistant will still be here. I haven't heard of this game before, might need to check it out.